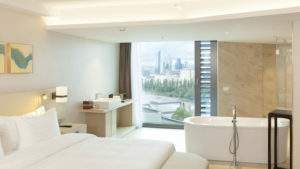 The 223-key Delta Hotels by Marriott Frankfurt Offenbach officially launched today, marking the European debut of the Delta Hotels brand. The property has more than 6,000 square feet of “ultra-modern” event space, including nine multi-function rooms. It also offers a 24-hour business centre, on-site parking facilities, complimentary WiFi, and a 24/7 fitness centre with state-of-the-art cardio equipment with touch screen technology. The property’s 208 guestrooms and 15 suites are decorated in calming hues and have floor-to-ceiling windows, providing natural light and sweeping views of the city. Keyless room entry is offered through the Marriott Mobile App. Situated on the left bank of the Main River between Frankfurt city centre and Offenbach, the hotel is within easy reach of the city’s historic and cultural attractions, and a short walk from the European Central Bank. 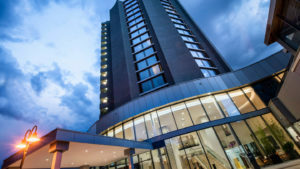 It is 16 kilometres from Frankfurt International Airport, and close to landmarks such as such Römerberg, Staedel Museum, and the chic boutiques of Goethestrasse. The property is operated by Odyssey Offenbach GmbH. Delta Hotels’ portfolio now encompasses more than 50 properties, with a pipeline of 30+ signed projects in North America, Europe and Asia. In addition to Frankfurt, the company recently added its first Chinese property in Shanghai and also plans to debut in Turkey this year.